The Parallax Propeller is a pretty powerful MCU as [Dino] recently discovered in his latest Hack a Week installment. 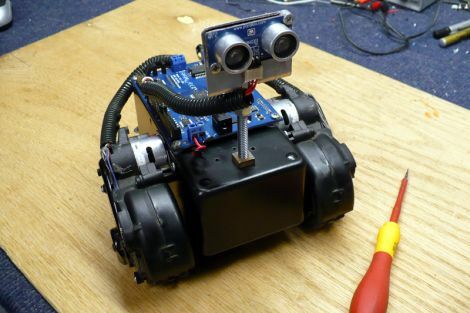 He wanted to build a simple robotics platform that he could use for testing out various sensors, and he figured he might as well learn about a different type of micro controller in the process. He pieced together his robot using a pair of old Roomba motors he had sitting around, mounting them on a standard RadioShack project box. A Propeller MSR1 control board runs the show, and a Propeller PING sensor is used to get an idea of what the robot’s surroundings look like. He is an admitted newbie when it comes to using Propeller micro controllers, but [Dino] was able to give his robot some rudimentary object avoidance abilities fairly easily. A few small bugs aside, he had the robot up and running in short order, a testament to how easy it is to work with the Propeller platform. Stick around to see a brief video covering the robot’s construction we have embedded below. I remember making this exact same type of robot with a BASIC Stamp II about ten years ago, great times playing with stamps! It looks really neat…but no weapons? What is the point of a robot if you can’t use it to fight other robots? Next project with involves LAZERZ!! Anyone else think the base had propellers in it? philosiraptor117 on Need A Small Keyboard? Build Your Own! Dusan Petrovic has added Vintage film viewers as RetroPies to Featured Projects. bthsdollz liked THE PERTEC WHISPERER-MAINFRAME TAPE DRIVE EMULATOR. bthsdollz liked Thumpware Media Controller. Dusan Petrovic has added Big 7 segment display to Featured Projects. bthsdollz liked MIDI Drum Module.